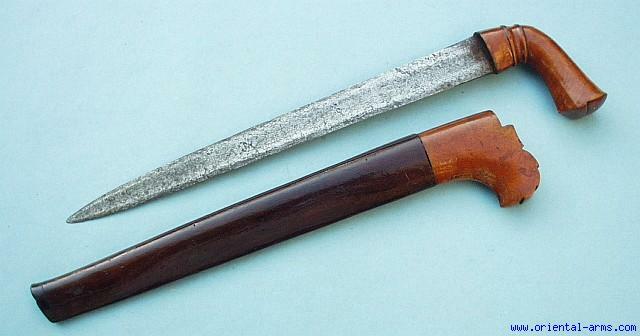 The Badek (or Badik) is a dagger / short sword from Java, Indonesia. It is characterized by its pistol grip shape handle. This one has a 13 � inches blade (unusal in a way as it is double edge and not sindle edge as in most of the badeks), forged from pamor steel. Wood handle and wood scabbard covered with very nice age patina. Total length 17 inches. Very good condition.